Winning Smiles Orthodontics > Blog > ORTHODONTIST OR DENTIST – WHAT IS THE DIFFERENCE? 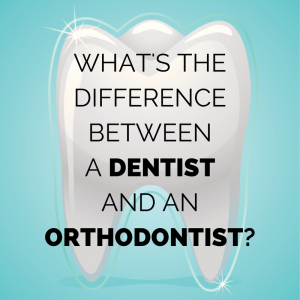 ORTHODONTIST OR DENTIST – WHAT IS THE DIFFERENCE? Both dentists and orthodontists attended four years of dental school after completing their undergraduate college degrees. At the completion of dental school, these oral health professionals receive a license to provide exceptional dental care for all of their patients. Some dentists, elect to go back to ‘dental graduate school’ to achieve a specialization in a specific oral health discipline. Dentists who would like to specialize in straightening teeth, must go through a rigorous and competitive selection process in order to be accepted into an American Dental Association (ADA) accredited orthodontic specialty residency program. These full-time residency programs are usually 2-3 years long, and many of these specialists like Dr. Derek E. Brown, will also study for, and receive a Masters in Oral Biology in addition to their Orthodontics specialty certification. Only 4% of all dentists are recognized by the ADA as orthodontists! Therefore, after receiving all of this additional training, orthodontists choose to limit their practices to aligning crooked teeth, correcting poor bites, and creating beautiful smiles. Due to the fact that orthodontists restrict their practices to working within our specialty, most Orthodontists choose not to do fillings, crowns, extractions, and teeth cleanings. These are the areas where General Dentists are most proficient, since their practices focus mainly on these type of services. This is no different than seeing your primary care physician for routine health assessments and physicals, while going to see the dermatologist for detailed skin care. Other examples are that most patients would elect to see a cardiologist for the very best heart care, while they would choose to see an ophthalmologist for the very best eye care. All of the aforementioned are doctors, but each physician has a very specific skill-set based upon their training and clinical experience. Family doctors will generally treat the entire patient, but when specialty care is required, the patient will usually seek out a specialist in that specific discipline. During orthodontic treatment, Dr. Brown always requests that his patients continue to see their primary care dentist for routine dental check-ups and cleanings at least bi-annually. Our goal is to make sure that by straightening the teeth and correcting the bite, that we can not only improve our patient’s smiles, but also make it easier for the primary dentists to help our patients to care for their teeth long term. After finishing dental school, did you go back to a full-time, accredited residency in Orthodontics over 2-3 years, or did you instead take continuing education weekend courses? How many cases similar to mine have you treated? Have you ever had to send a patient who was in either braces or Invisalign to an orthodontist to help you to complete their treatment? Have you treated your children or family members with braces or Invisalign, or did you send them to an orthodontic specialist? In summary, both dentists and orthodontists are trained to provide our patients with phenomenal oral health care. However, dentistry is no different than the medical profession in that by virtue of both schooling and clinical experience, the dental specialist will generally provide the best and most comprehensive treatment in their chosen specialty. For Dr. Brown, that dental specialty is orthodontics. Before any patient elects to get specialty orthodontics work done, including Invisalign, or Clear Correct, it would always be in their best interest to see an ADA accredited Orthodontist for the specialist’s opinion. Similarly, if an orthodontist recommends that his/her patient get an implant or a crown, the patient should always ask to be referred back to their primary dentist to have these procedures scheduled.